But with the drop in energy comes the scent of gold, as we prepare for the annual Cannes parlor game of loudly criticizing the jury’s decisions. We’re still three days away from the Competition awards — though Aki Kaurismäki’s broadly liked comedy “Le Havre” (which I frustratingly still haven’t seen after three attempts) has emerged as the sizeable Palme d’Or favorite, while I hear rumors that Olivier Assayas is the lone “Tree of Life” fan on the jury — but the trophy run began tonight with the winners of the Critics’ Week sidebar. I haven’t seen as many of the 22 films selected for Critics’ Week this year as I’d hoped to, so it’s by sheer luck that I happened to catch the strand’s big victor. 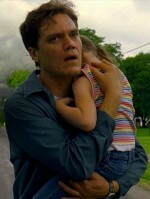 US director Jeff Nichols’ sophomore feature “Take Shelter,” already a critical favorite at Sundance, continued its run of good festival fortune by taking the Grand Prix from a jury headed by Korean auteur Lee Chang-dong, as well as the alternatively-juried SACD Prize. Full list of Critics’ Week winners here. I saw the premiere of this film at Sundance and loved it. It’s good to see that it’s getting some recognition at Cannes. Do you think Michael Shannon has a shot at a Best Actor nomination for this? You have my full support, Brock. something tells me The Artist is taking the Palme. Do you have a source for Assayas being the only TTOL supporter? Wouldn’t surprise me given the quality of his films. I would love to see Kaurasmaki win the Palme. That man delivers nothing, but dead pan brilliance every time. Yer: I do have a source, and a credible (if not foolproof) one, but I obviously can’t name names. Are we not forgetting the most important award of all: the Palm Dog? This year it was the mutt from ‘The Artist’, with the Jury Prize going to the canine in ‘Le Havre’. Who needs any other awards? Guy, can you provide any insight into the actual deliberation process? Does the jury meet regularly throughout the fest to compare notes? Also, what’s the critical consensus on the UCR stand-out? Key Lime: Every report I’ve read from past jurors (I highly recommend William Goldman’s “Hype and Glory” for first-hand insight into the process) suggests they meet at regular intervals to discuss the most recent batch of titles screened. As for UCR, the film that has generated the most excitement is one I sadly haven’t seen: Mexico’s “Miss Bala.” Meanwhile, I was very keen on “Skoonheid,” while “Martha May Marcy Marlene” continued its excellent run of reviews from Sundance. Thanks for the tip on the Goldman book! With Emir Kusturica as UCR jury president, I’m betting heavily on Miss Bala. It sounds like precisely his sort of film. I’m not saying there aren’t some good reviews (EMPIRE AUSTRALIA gave it five stars), but generally, it’s not receiving the love that our last Cannes winner, SAMSON AND DELILAH, got.